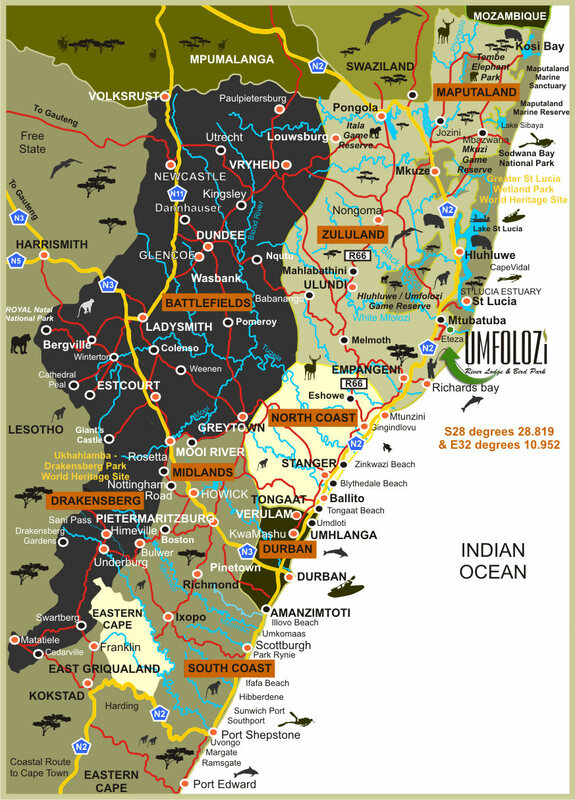 Use the N2 Highway and pass King Shaka International Airport, Stanger, Empangeni, Richards Bay and Kwambonambi (± 2 hours drive). Turn right at the Eteza / Mapelane Turn off. Cross the railway line and turn left within 400m and follow signage. Use the N2 highway pass the towns of Witbank, Bethal, Ermelo, Pietretief, Pongola, Mkhuze, Hluhluwe, Mtubatuba. Remain on the N2 and cross the uMfolozi river, pass the overhead bridge, the road branches off to the left, at the stop street turn left again, continue along the road crossing a train track. Follow signage to the Umfolozi River Lodge & Bird Park.